Perhaps you noticed wild-eyed, Spandex-clad society types roaming the streets of New York City this weekend, hungry for EXERCISE. 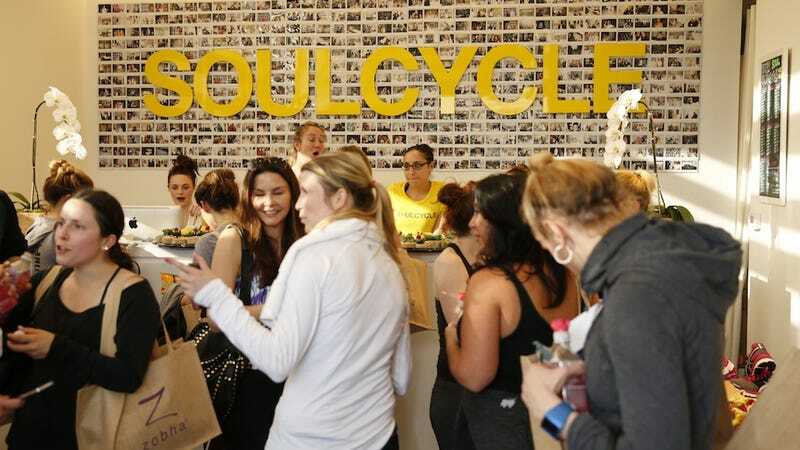 Those would be SoulCycle obsessives whose workouts have been thrown into chaos, absolute chaos by renovations to one of the company's downtown Manhattan outposts. "After I'm done crying, I'll get over it and go to another studio reluctantly," said Ms. Berger, who, when choosing a New York City apartment with her husband, evaluated the proximity of those under consideration to the TriBeCa "Soul sanctuary," as the company refers to the studio. With classes now taking place there every half-hour at peak times, the already mad crush to sign in and find a locker is more of a workout than usual. And there's the loss of V.I.P. status that regular TriBeCa riders enjoy at their mother ship. At other Soul studios, the receptionists do not recognize them (or know their shoe size). It then becomes an even steeper challenge to charm staff members the riders do not know in order to land a slot in class. Oh, the humanity! Keep the SoulCyclers in your prayers, everyone—at least until the Tribeca location reopens in a mere three weeks.